We’re happy to announce the full schedule for AbroadFest 2015! All AbroadFest attendees are encouraged to pick up their tickets at The Room from 1:00-8:00PM on Thursday night. This will help you avoid long lines at the venue each night. ABROADFEST Night One (Thursday, March 5th) kicks off at one of Barcelona’s premier nightclubs, Razzmatazz (Carrer Almogàvers, 122) with DZEKO & TORRES. The headliner of the night is referred by the Miami New Times as “one of the most impressive acts in EDM,” MADEON. This will be one of MADEON’s first shows presenting songs off his forthcoming debut album out on March 31, Adventure. 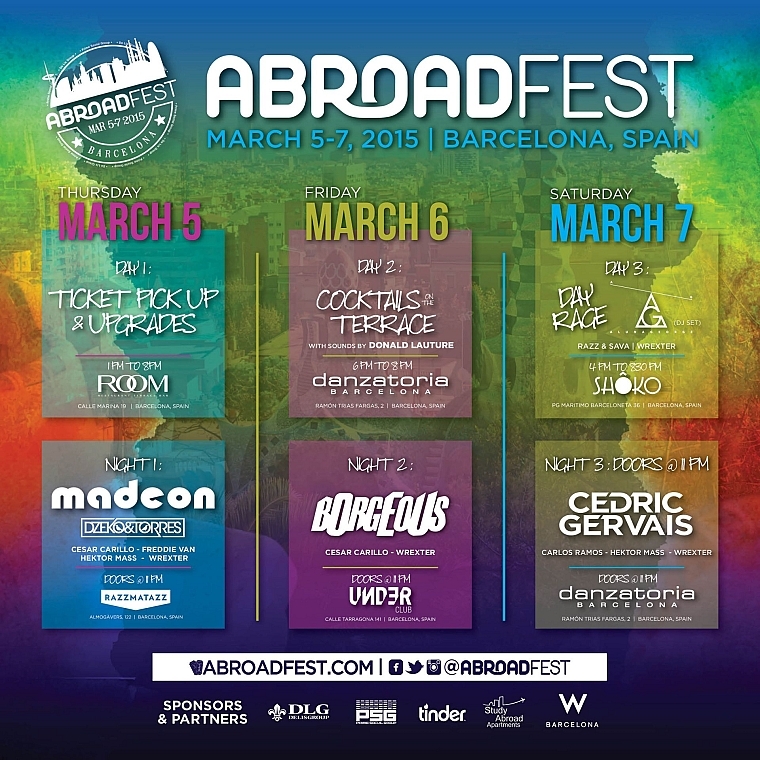 ABROADFEST Night Two continues onto Under Club (Calle de Tarragona 141) with Beatport chart-topper, BORGEOUS. Attendees are also invited to “Cocktails on the Terrace” 6PM-8PM at Danzatoria (Ramón Trias Fargas, 2) to start off the night. ABROADFEST Day Three (Saturday, March 7th) begins with a Day Rage Party from 4PM-8:30PM at beach club, Shoko (Passeig Marítim Barceloneta, 36) with electronic music duo, AlunaGeorge. ABROADFEST Closing Party at Danzatoria ends the festival with Grammy Award-winning CEDRIC GERVAIS! 3-day weekend passes are SOLD OUT! Single-night tickets for Thursday’s performance with Madeon are still available but will sell out – click here to get your ticket.